In my never-ending quest to find indoor things to do for the little ones during summers in Bahrain, I'll mention a few things at Seef Mall in Manama. Like every other mall here, they have a play area. This one is called Magic Island. It has video games and little merry-go-round and car rides. It has a small bowling alley, a miniature train and even a climbing wall. It also has lots of games and rides for big kids (and adults) as well. It has an enclosed jungle gym area, where kids three and up can play for 2.5BHD (~$6.50) for two hours (don't forget your own socks, otherwise you'll have to buy them). They also have a large trampoline area, however it's 2BHD (~$5) for just 10 minutes, which seems a bit scandalous to me. All of these play areas require their own card, so if it's your first time, just go ask for their card and add some money to it. I have a stack of them in my wallet now ready for any destination. At the other end of the mall, near Marina Home, there are a few other options. There's PLAY Activity Center (phone: 17564900, playbahrain.com), which offers enrollment like a nursery school, for three or five mornings a week, as well as just a drop-off service for 3BHD per hour. They stress sensory play and the ages range from infant on up. They have ride-on toys, craft areas, a play bank and supermarket, even a sand play area. It's also a shoe-free zone and socks are required, or can be purchased. Across the way is Jumping Clay. This is for five and up and for a one-hour session, during which time they can make one project, it costs 6BHD. For those interested, there's also a Little Princess spa where little girls can purchase princess outfits, get a haircut and manicure, pedicure, facial, etc. No surprise, they are also available for birthday parties (all of these places are). Contact 17564585 or littleprincessme.com. Also upstairs, around the corner from PLAY, is L’Atelier Art Lounge. They allow kids in from two up. For the two-year-olds they request that an adult stay, but they said for older kids, even three and up, they could be left as long as you leave your phone number and are willing to retrieve them. There is a little train on the ground floor at this end, right outside Marina Home. I've never seen it actually moving, nor anyone working there, but it provides a climb-in climb-out structure that can fill a good 15 minutes, if needed. Please keep in mind that this is far from an exhaustive list of kid-friendly things to do at Seef. Even during the last nine months we've been here, shops have come and gone. 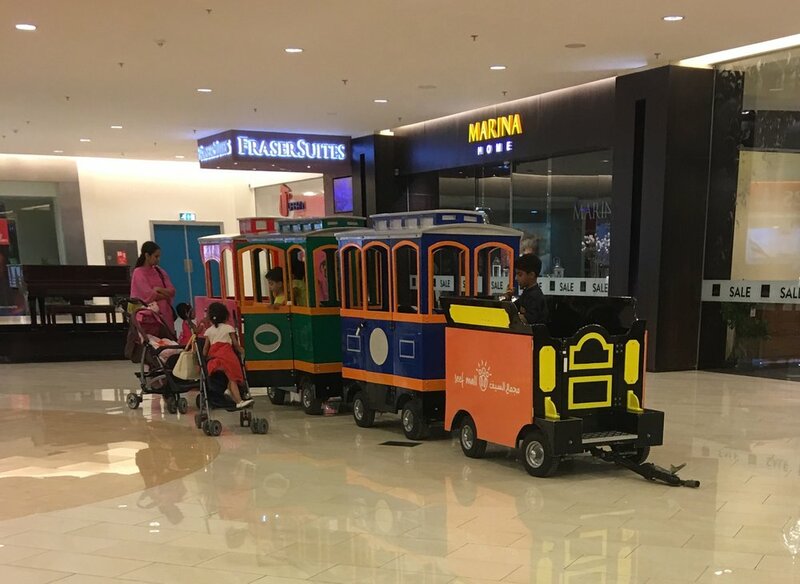 But it should give you at least an idea that there are a variety of things to do, depending how much you want to spend and what your child's interests are, at Seef Mall. And definitely don’t discount the escalators and elevators; endless fun for the whole family. It's all about summer survival!